In recent months, Outback Jacks has sprung up in place of the vacated Gilhooleys, taking over the polished wood setting at Westfield, Strathpine, with vigour. 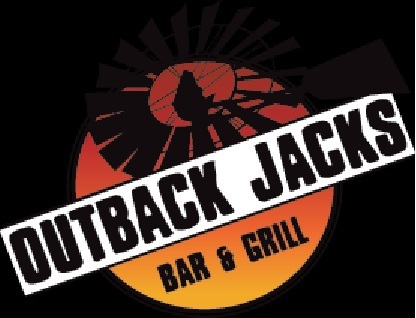 Ever since Outback Jacks made home within Strathpine, it has become a popular meal-time choice for families, friends and couples alike. Outback Jacks is a steakhouse first and foremost, and this is reflected in its large menu. Grain fed and grass fed steak, rump steak, eye fillet steak, sirloin, T-bone – lots of choice with the steak here. You can order your steak in varying 'degrees of doneness' and size, with salad, chips or vegetables. Sauces and toppers can also be added to steak meals. I'm a big fan of both the mushroom and creamy garlic sauce, as well as the garlic prawns topper. The Outback Jacks menu offers entrees (garlic bread, calamari, nachos), salads, seafood, burgers, chicken (chicken parmigiana, chicken schnitzel), bangers and mash, ribs and pasta if you're not keen on a big juicy steak, and there are kids meals too. I've been to Outback Jacks at Strathpine a number of times now, and I really enjoy going. The atmosphere is laidback, welcoming and friendly, as are all of the staff I've encountered. The staff always seem happy and smiley; returning throughout your meal to ensure that you're satisfied. I can always have a joke and a laugh with them and that means a lot to me in customer service. I like the 'outback' theme and décor; the wood panelling and tables, the huge crocodile on the ceiling, the varnished bar and the wooden arrow signs pointing to the 'dunnies', Longreach, Goondiwindi and the Wine Room (the bar). The Aussie images and longhorn bull skulls covering the rust-coloured walls are a nice touch also. Now to discuss the food. For the purpose of writing this article, I recorded all food consumed on my last two visits to Outback Jacks at Strathpine. I was discreet, the staff didn't know I was taking photos or notes on my phone and they treated me as they always do – happily and with respect. We'll call the last two ventures, Venture 1 and Venture 2. Both ventures had two attendees, myself included. Here's what was consumed on my last two visits to Outback Jacks. Meal 1: Sparrows prime 300g rump, cooked to medium with chips, salad, creamy garlic sauce and the 'surf & turf' topper (grilled barramundi and garlic prawns). Meal 2: Sparrows prime 300g rump, cooked to medium well done with chips, vegetables and Diane sauce. Meal 1: Jacks Lump A-Rump prime 500g rump, cooked to medium with chips, salad and mushroom sauce. Meal 2: Chicken parmigiana with a side of Diane sauce. On both occasions, the steak was always cooked to the 'degree of doneness' ordered, and was succulent and tasty. I like my meat to be a bit pink in the middle and that's what I got. Whatever herbs and spices the chefs at Outback Jacks put on the steak is just enough, so that sauces are not overpowered by other peppery tastes. The chips are always a mix of soft and crunchy which is good because I like a bit of both, and I like to dip my soft chips in my sauce of choice. The salads have been fresh for every meal; crisp lettuce and carrot, cucumber, tomato and onion, and the coleslaw is good also. Personally, I really enjoyed the creamy garlic prawn toppers – they really are creamy, just the way I like them and the Barramundi was also supple and fresh. The Surf & Turf Topper is definitely worth the price to add an extra zing to your steak meal. The honourable mention, surprisingly, goes to the chicken parmigiana which was not actually my meal to eat, although I tried some at its owner's bidding. The chicken parmigiana was the best I've ever tasted. No really, it was. Soft, saucy, tomato-y, cheesy but not too cheesy, with crisp pink bacon cooked to perfection. Mmm, it was delicious. I have no words to describe just how good that chicken parmigiana tasted. Not that I've eaten truckloads of chicken parmigiana before, but this one was heavenly. I would definitely recommend paying a visit to Outback Jacks at Strathpine if you haven't already. It's a great steakhouse for the whole family. Visit the Outback Jacks website here or Facebook page here. Why? Because you like steak. Where: Outback Jacks, Westfield Shopping Centre, 295 Gympie Road, Strathpine, QLD. Cost: Prices are available on the website or in store.